Lenses in astrophotography have been bit forgotten in favour of big and shiny astrographs. With the introduction of latest CMOS based cameras with smaller pixels lenses become a very interesting and viable option for DS imaging at a low cost. What are the lens options we have today and how can we connect them to our DS or planetary cameras? Some cameras, like smaller ZWO cameras, come with CS lenses and a T2 adapter for them. Machine vision cameras like Point Grey have C/CS thread and can use them out of the box. CS lenses focus at 12.5mm from flange, while C lenses at 17.526mm and both use the same thread. Cameras marked as CS have sensors close to the thread and can handle CS lenses and C lenses with spacer ring. C-mount cameras have sensor further away from the thread and can focus only with C-mount lenses. CS lenses are very cheap and you can find them in shops with surveillance cameras. Those lenses support small sensors, usually up to 1/3" in diagonal. Their image quality may not be the best. 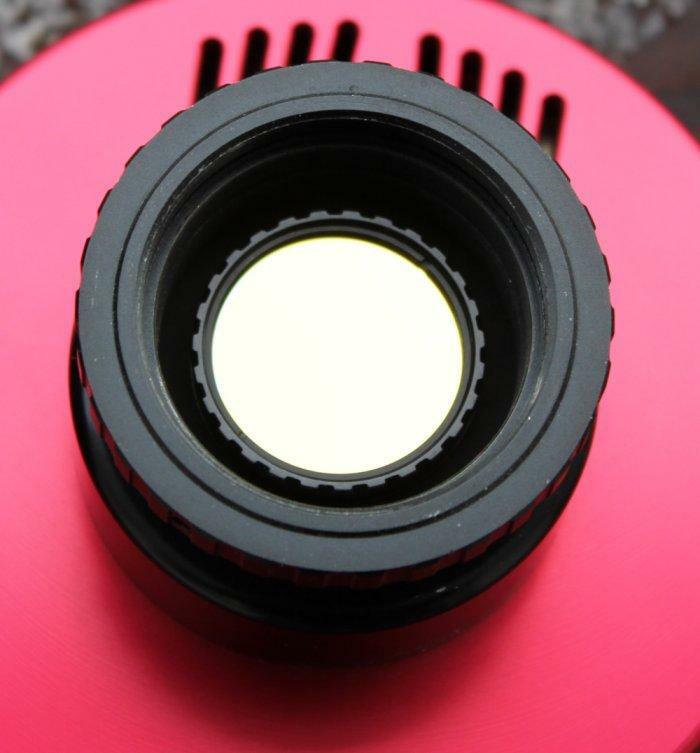 C lenses usually are much more advanced designs and support bigger sensors, even 2/3" or 1". However they get quite expensive, reaching prices of Canon DSLR lenses. On ebay and alike sites you may however find used ones at much lower prices. As the focal length of such lenses is very short, like up to 16 mm their field of view is enormous and resolution is low. Even small planetary camera can fit a whole constellation or most of it on the frame. It can be used to capture wide nebulosity regions or just star fields like the Milky Way. As the backfocus is short you can't put a filter wheel in between the lens and camera, but you can put a 1,25" filter on the lens. If the filter ring is tall it can nicely lay on top of the lens, but in general you will have to find a way to mount it more reliably. Wide field of view and fast f/ratio will often cause strong gradients (like from local light sources) on the frames. You will have to use IRIS or other similar application to remove them. I tested a 2/3" C-mount 16mm lens and it did focus with Atik 314L+ (ZWO adapter) and ASI178MM cooled cameras. Test picture made with Atik 314L+ got a big gradient, but IRIS processing removed it. The M42 lenses were used with DSLR of the past century . you can still find them on ebay and alike sites, and some photographers use some of them. A lot of old lenses may be corroded by time, but there are still good quality lenses and if they are of a good brand they offer good enough field correction to be usable for astrophotography. Prices for such lenses are much lower than for example Canon lenses, but you have to find a good one on your own. Try Googling the lens name for photos or reviews to see if it offers good image quality. Astrophotography easily shows all those field quality issues lens may have (like a refractor with field curvature). Such lenses have focal lengths from around 20-30mm up to 300mm. There are longer focal lengths too but the f/ratio drops significantly which makes them less efficient at astroptography. M42 lenses have 45.5mm backfocus so usually you can put a filter wheel or drawer in between lens and the camera. Some lenses may however have shorter backfocus and then only option would be to use a 1,25" filter inside a T2 spacer (Baader continuous T2 male with filter thread and Baader continuous female T2 ring). To make the lens focus you may need few very short T2 spacers to set the correct distance - each model may differ a bit. For generic DS imaging focal lengths 100-300mm can be used with similar results to small ED/APO refractors at a fraction of the cost. However you have to mount everything together on your own. 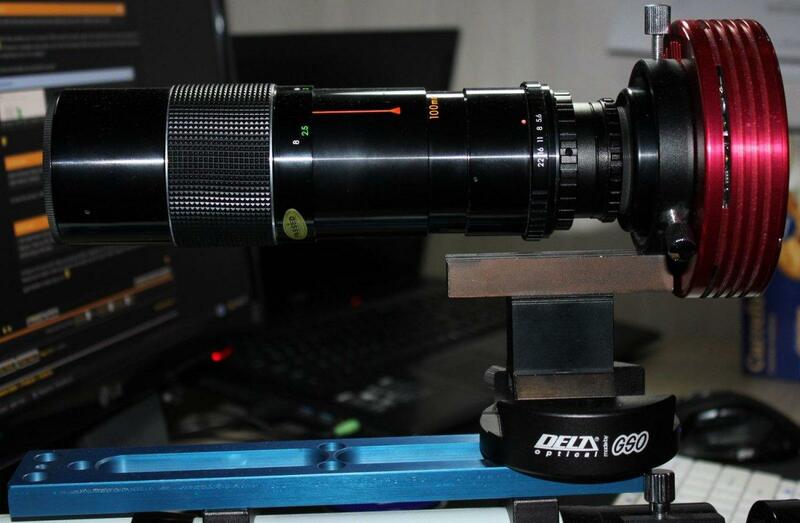 Focusing a lens is also bit harder than a refractor with a good focuser. Farpoint and Gerd Neumann make Bahtinov masks for lenses. Also there are no field flatteners for lenses so you are left with the field the lens gives. Some of them (like Tair 3S) can however be quite good. The lens have a M42x1 thread and to connect it to a T2 (M42x0,75) thread you can use a Baader 1508015 adapter. You can use T2 spacer directly but it won't handle the lens f/stop correctly. To mount the lens and camera to a mount you can use a finderscope guide rings. With a lightweight lens I locked the ring on Atik camera body, but with very heavy and long Tair 3S I used the lens itself to mount it via rings to a dovetail bar. Most lenses has quite small diameter so you would have to have rings for a very small guide scopes which may be hard to find (like 70mm or bit less). At 100mm focal length you can already photograph most wide objects like if you would be using a small refractor, for example rosetta nebula. At 300mm you have even more telescope-alike setup, and it will more likely require guiding. Modern lenses have more advanced lenses that aside of electronics also have better field correction. Still not every Canon lens will give nice pin-point stars, but some of them will be very good at it. 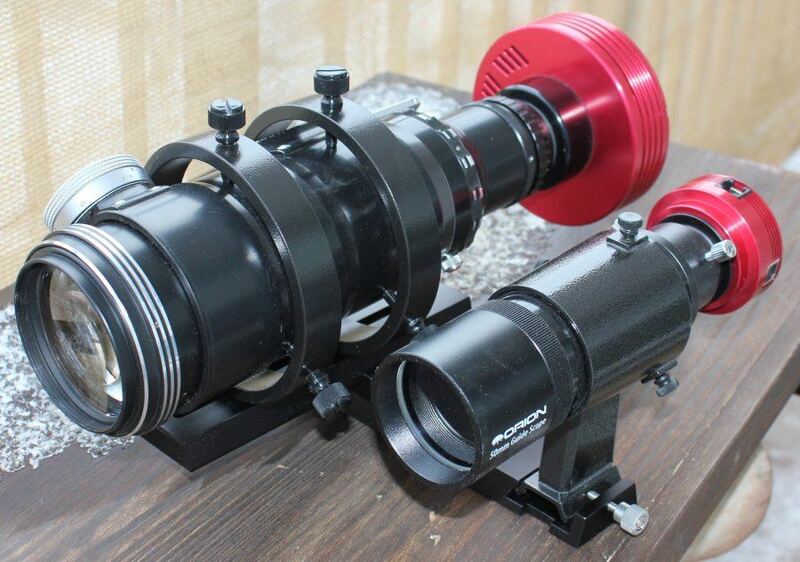 The drawback is very high price, some are more expensive than small telescopes. If you already have or plan to have good Canon, Nikon and alike lenses then you can also connect them to your DS or planetary camera. There are many adapters for Canon lenses. Basic ones offer just thread connection, while more expensive will also have tripod adapter which can be used to screw to a tripod, or more often - telescope piggyback or dovetail bar with tripod screw. M42 as well as Canon lenses may at some point require guiding or finderscope for ease of use. 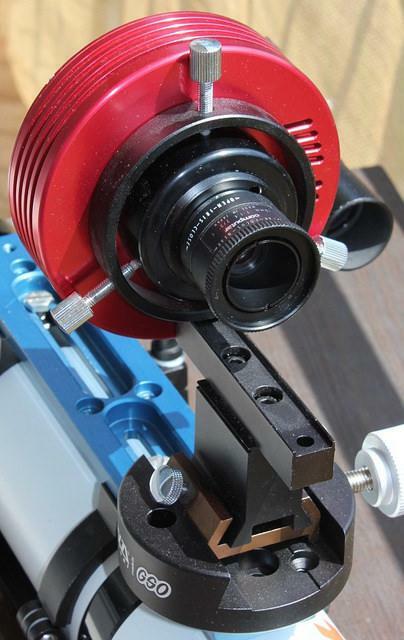 You can use dovetail-adapters that allow mounting two telescopes or a telescope and a finderscope side by side. However this adapter will be harder to balance. As the setup won't be a symmetrical OTA the balance will change with the telescope position. You will have to balance it for the position it will be imaging in. New cooled ZWO and QHY cameras based on latest CMOS sensors have small pixels, even 2.4 micrometer in IMX178. Such small pixels makes using most telescopes quite hard for DS imaging as the resolution will be high, to high for your sky seeing in many cases. Short exposures limit seeing, but still, it may be not be as effective as just using a lens and shooting at short focal length with fast f/ratio on not so low resolution in the end. This can be a quite cost effective setup for DS imaging with new cameras. If you have a good lens with good field quality, and a good set of accessories to mount it all and then focus - then you are ready to go and you should get very good results with it.